Play spider solitaire at Ludi. 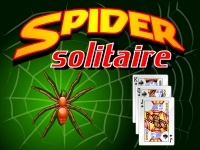 Spider solitaire is a more recent puzzle dating from 2000. The goal is to achieve 8 suits of the same color starting with the king and ending with the ace. The difficult level rises as new colors make their appearance. The goal is to remove all the cards from the game making the fewest possible moves. To remove cards, you have to build descending runs (by rank) of the same suit, starting with the King and ending with the ace. In the spider "medium" and "difficult", you can lay down runs in alternating red and black suits, but you still need to construct complete runs the same suit to eliminate the cards. The game is more difficult when played with more suits. Spider Solitaire is played with two decks giving 104 cards, some suits are removed from play in the "easy" and "Medium" levels. Ten stacks of cards are dealt the last card of each stack being turned face up. The remaining cards are placed face down at the top left to form a 'stock' they are used to deal a new row onto the stacks if you reach an impasse. Runs must be built in descending numerical order - You can move the last card of any stack to a card numbered one higher (on the top of another stack). e.g. a '4' can be moved onto a '5'. You can move a 'running' portion of a stack as if it were a single a single card. Click on the highest card in the run to move it. You can move the top card of a stack to an empty stack. Once you have created a complete run (king to ace), the cards are removed to the top of the screen. If you are stuck and need to receive a new row of cards, click on the stock. Free working space as quickly as possible, remove all the cards in a run and try to place cards on the pile that you just emptied. This will allow you to construct longer sequences (runs). When you choose a higher difficulty levels, avoid placing small cards on cards of another color if they are blocked until you remove the cards from the top.